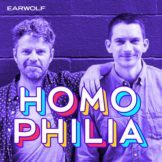 It’s two-guest time on this week’s Homophilia! First, Dennis Hensley joins Matt & Dave to play the hilarious TMI party game: “You Don’t Know My Life”. Then, comedian Robin Tran joins the guys to talk about accidentally meditating, coming out on FB messenger, and finally smiling in women’s clothes. This episode is sponsored by Phlur (www.phlur.com code: HOMO) and Calm (www.calm.com/HOMOPHILIA).